Being in the hospital can be stressful and confusing. It can be difficult to get the information you need from your doctors and healthcare team, ensure all members of the team are communicating to lower the risk of medical errors and inappropriate testing and care, and make medical decisions when you’re ill or injured and under stress. That’s why having someone who can advocate on your behalf with doctors, nurses, and other hospital staff members can be valuable. There are several key roles your advocate may take on. What those roles entail will be different depending on your condition, for example whether you’re able to speak for yourself or you need someone else to make medical decisions on your behalf. Talk with the physicians and others involved with your treatment: Your advocate can meet with you healthcare team and ask any questions you have about your diagnosis and treatment plan. 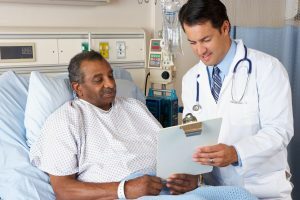 If possible, your advocate should be present when your physician sees you during daily rounds in the hospital and take notes on how your treatment is progressing, what the next steps are, and raise any questions or concerns you or advocate has about your care or your condition. Provide your medical history: An advocate can provide your treating physicians with your medical and family history if you’re not able to. If possible, keep your medical records in a secure electronic format so that accurate information can be easily shared with everyone who treats you. In an emergency, your advocate can describe the symptoms causing your need for hospitalization, including when they started and whether you’ve experienced these symptoms before. Help minimize the risk of medical errors and hospital acquired infections: Medication errors can cause serious harm, so your advocate should have a list of all the medications, including over-the-counter medications and supplements, that you take, as well as any medication allergies. When hospital staff come to administer medications, your advocate should confirm what the medications and dosages are, as well as checking to make sure the doctor or nurse is delivering those medications to the correct patient. If a new medication is prescribed, ask what it is, what it’s for, and what potential side effects you should be aware of. Your advocate should take the same approach when someone comes to perform or take you for diagnostic testing or other procedures, checking to make sure they have the right patient and that the test or procedure hasn’t already been performed by another member of your healthcare team. It’s also wise to remind all visitors and healthcare professionals to wash their hands before they come into contact with the patient. Make sure your wishes are respected: When you choose an advocate, make sure you share what types of care you do and do not want to undergo in case of a serious illness or injury. For example, would you want to be put on a ventilator or feeding tube and, if so, under what circumstances? Do you have a do not resuscitate order? Ask about follow-up care and recovery: When you’re ready to be discharged from the hospital, your advocate should ask your physician when you need to be seen for your first follow-up visit and by whom, if there are any medications you need to continue taking or should discontinue, how to care for any incisions or wounds, if you need any special equipment at home during recovery, if there are limitations on what you can do, and what symptoms could indicate a complication or side effect that requires medical attention.